Wipro 3D is the metal Additive Manufacturing (AM) Solutions and Services business of Wipro (www.wipro.com), a USD 9 Billion global corporation headquartered in Bangalore, India. Wipro 3D is a leading provider of metal additive solutions and services to the Aerospace, Space, Defense, Industrial, Healthcare, Heavy Engineering, Automotive, and Nuclear sectors. We offer the complete suite of solutions including Additive Consulting and Road Mapping, Additive Engineering, Additive Manufacturing, Research and Development Services, right up to Design, Build and Operation of Captive AM Centres for our customers. Wipro 3D works with clients from discovery to design, development to deployment of metal AM solutions including setting up of captive AM centers. Our AM experts work closely with customers’ strategy, technology, innovation, engineering, R&D manufacturing, quality, and supply chain functions to deliver Additive Manufacturing solutions and services that are focussed on business outcomes. Wipro 3D is a business division of Wipro Infrastructure Engineering (www.wiproinfra.com) which is a diversified business with expertise spanning over 4 decades of engineering and manufacturing excellence in the fields of Hydraulics, Aerospace, Water treatment and Additive Manufacturing. The Hydraulics business specializes in designing and manufacturing custom built Hydraulic Cylinders for applications in diverse segments such as Construction & Earthmoving, Material & Cargo Handling, Forestry, Farm & Agriculture, Mining and Truck Tipping. It is amongst the largest independent hydraulic cylinder manufacturers in the world, delivering over one million cylinders to OEMs in different geographies. Wipro 3D consultants and experts study the client context, define an adoption roadmap, jointly identify pilot and production projects, understand functional and performance expectations and discuss potential business value additions through Additive Manufacturing. To realize the potential of Metal AM into business operations, a systematic approach to adaption is required. Additive Consulting from Wipro 3D includes discovery and adaption strategies and methods that are aimed at introducing stakeholders to various technical considerations. Wipro 3D’s Additive Design and Engineering services are based on a deep understanding of various aspects of the technology. Wipro 3D offers a complete suite of manufacturing services based on a strong quality framework. The services range from prototypes right up to production runs of metal components. Additive developmental projects require technical resilience and ability, a collaborative mindset, research capabilities both in-house and in the partner ecosystem and business models that support such projects. Wipro 3D has all these attributes. Some of our Industrial customers eventually may wish to bring the technology in-house and develop captive Metal Additive Manufacturing centres. 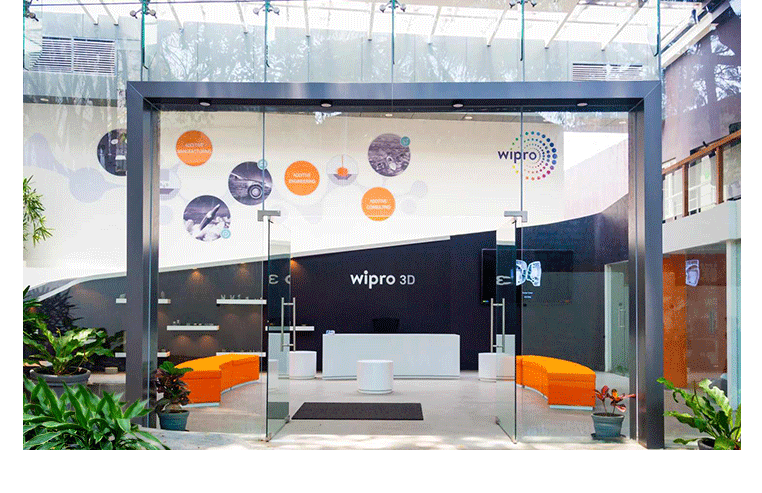 Wipro 3D recognizes this strategic imperative. Metal Additive Manufacturing, builds near net-shape components and a set of co-ordinated post processing technologies is used, on a case-to-case basis, to meet the overall technical requirements of a component. One such metal 3D printing process is Selective Laser Melting wherein layer-by-layer metal powder is coated, melted and fused to the previous layer. Other techniques involve deposition of metal powder or wire, delivered coaxially with an energy source such as a laser or electron beam, and melted on the substrate/ surface of the part. Both technologies deliver applications that span prototyping, production and aftermarket services with solutions in Titanium, Inconel, Aluminium, various steels as well as custom alloys. Additive Engineering is the key competence required to derive maximum value from the technology. A unique combination of domain knowledge, Additive Engineering principles, Structural Engineering, Metallurgy, Application Engineering, Optics, Powder Metallurgy, Conventional machining, Thermal Engineering, and business consulting are used to design and deliver a complete solution that delivers business benefits to customers. Metal AM technologies vary based on several parameters such as energy source, feedstock, the method and environment in which the feedstock is exposed to the energy source, the placement and delivery of the feedstock and several other considerations. Post Processing is a series of pre-planned operations on a component or a batch of components that make a 3D Printed part meet the required quality and end-use requirements. Feedstock is one of the most critical aspects in Metal Additive Manufacturing, that affects and determines component and process quality and repeatability. Qualification of components is significantly dependent among other things, on characteristics of the feedstock and how the alteration of these characteristics over repeated usage can be measured and controlled. Post processing encompasses everything that occurs from the time a build is complete to the time a 3D printed part is ready for its intended use. Metal powders for additive manufacturing are made through an atomization process, which is the melting of a metal into a pool or the direct melting of a metal bar or wire in an evacuated or protected environment. GLOBALLY METAL 3D PRINTING IS REDEFINING INDUSTRIAL MANUFACTURING AS WE KNOW IT. Metal 3D printing allows enterprises to improve functional performance of components, achieve complex geometries, optimise weight, reduce wastage, and innovate on design, at the same time, achieving a significantly shorter 'Time-to-Design' and 'Time-to-market'. The Aerospace industry has been at the forefront of adapting Metal Additive Manufacturing (AM) and some of the most evolved applications of metal AM can be found in the aerospace sector. Leading OEMs, tier 1 suppliers, and key ecosystem players are in the phase of developing mature capabilities in metal AM. Additive manufacturing is reaching outer space. Private space enterprises, state-run-space organizations, and other members of the space industrial ecosystems are quickly developing new concepts and possibilities based on AM capabilities. . The defense industry is among the earliest adopters of Additve Manufacturing along with the Aerospace industry. State run defense agencies and private defense organizations have long since adopted metal AM and are using AM in highly critical projects for missiles, fighter jets, customized equipment, handheld weapons, drones, spare parts, tools and much more. .
Healthcare organizations across the globe face the challenge of sourcing low-volume, high-quality precision components at an optimum cost. Engineering design, and therefore production of components in the industrial sector, is primarily decided by the technical capabilities of conventional manufacturing techniques that revolve around forming, joining, shaping, and so forth. Additive Manufacturing is finding a great ”fit” in end-use application in both, the upstream and the downstream of the oil and gas sector. A variety of components are being produced by AM such as tiny connectors for mist seperators, customised valve filters, control valve parts, much larger stators and swirlers for industrial gas turbines and now turbine blades. Additive Manufacturing is steadily gaining interest in the Nuclear industry. Around the world, the nuclear sector is increasing the efficiency of their manufacturing processes by adopting AM. Owing to advancements in AM, new avenues are available for the automotive industry through newer designs; lighter, and safer products; shorter lead times; and lower costs. Varied and complex, inter-dependent competencies are required for a metal component to be designed-engineered, manufactured, proven out and produced in volume using Additive Manufacturing. Advanced know-how of Additive Design & Engineering principles, a well-synchronized pre-build, in-build and post-build strategy, experience in process control, characterization capabilities and strong post-processing execution, govern successful usage of metal AM in mainstream business operations.